These days, it's hard to survive without external power for our smartphones. The 3000mAh or so units that are inside can't last throughout all the browsing, gaming, picture-taking, and media consumption that many of us do every day. 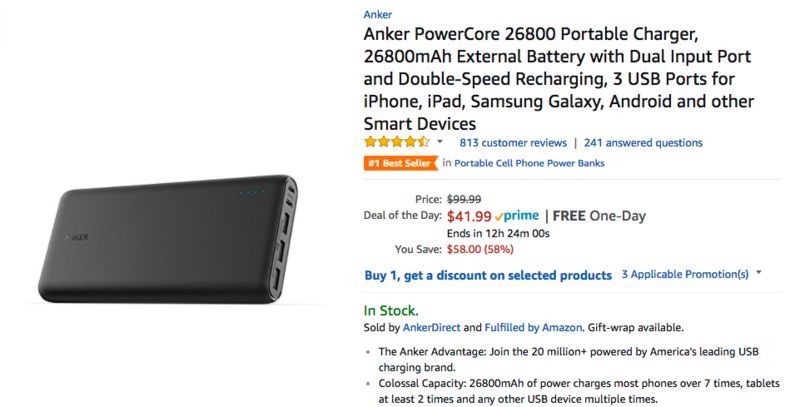 But if you don't already have a battery pack (or if you just need a bigger one), Amazon has the Anker PowerCore 26800 that stores a whopping, you guessed it, 26,800mAh of juice for only $41.99. The PowerCore 26800 is a beast of a battery. It sports 3 USB output ports that can push 3A through a single port, or 6A in total. There's no Quick Charge technology on board, but an output of 3A is more than enough to move the charging along at a decent pace. It also has the unique distinction of having two microUSB inputs, which means that the battery can recharge twice as quickly when both microUSBs are plugged into it. Anker includes two microUSB cables in the box. This battery ordinarily goes for $59.99, and the current price of $41.99 is the lowest we've seen. If you want one, you have until the end of today to make the purchase, as this discount is part of Amazon's Deal of the Day. As of this article's publishing, that means that you have another 12 hours, so you should be able to grab one as long as you don't fall asleep.